Don' Waste Your Time with Ads. PlayOn Cloud and PlayOn Desktop lets you record your favorite streaming TV shows and movies and then watch them commercial-free. Just find the show you want to record in the PlayOn Desktop or PlayOn Cloud streaming DVR, and hit record. When your recording is ready, just say yest to "Watch with AdSkip" to watch without the ads. If you have PlayOn Destkop, you can set up subscriptions to your favorite streaming TV shows, then they’ll automatically be ready and waiting for you to watch without ads. 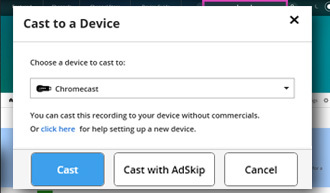 Download your recordings to your iPhone, iPad, Android tablet or stream recordings to your TV. Skip the commercials. We make TV better. When PlayOn makes a recording, chapter marks are inserted where the commercials are inserted in the stream. During playback, all of the PlayOn player apps (like the PlayOn iOS or Android app — or if you have PlayOn Desktop — the Roku channel, Chromecast, FireTV casting app, or Xbox) have logic built in to skip from the beginning of the commercial to the end  giving you a seamless ad-free viewing experience. Which PlayOn Streaming DVR is Right For You? Both PlayOn Cloud and PlayOn Desktop lets you record streaming movies and shows from Netflix, Hulu, Amazon, HBO and many other popular streaming sites so you can watch anytime, offline, and even skip the ads. The mobile streaming DVR app that records streaming videos via the cloud. No PC needed. Easily download recordings to your phone, tablet or to a PC or Mac to watch offline. Turn your PC into a streaming video recorder and media server. Record, cast, and stream your favorite online shows and movies. A robust, all-in-one solution.